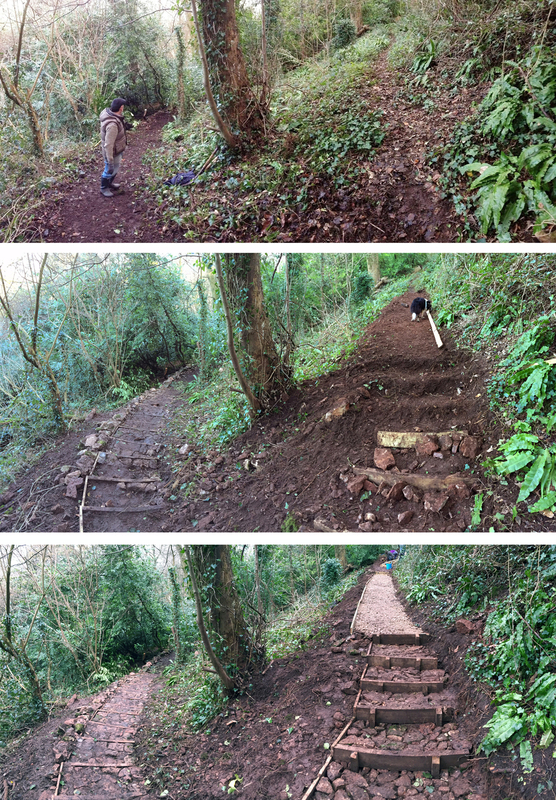 We’ve finally completed a project we began in January; the steps linking the historic upper and lower paths through Penpole Woods. The works are all part of a project in Partnership with Bristol City Council and grant-funded by the Forestry Commission to improve access within the woodland. The steps were one of our priorities and we worked with the Forest of Avon Trust to ensure that they formed part of the original bid. January’s 2-day training course was really well attended and over the two days we had more than 20 KWAG volunteers learn how to put the steps together. Our thanks go to Bristol’s Conservation Volunteers, the training they gave us, and for some of their own volunteers who came along to help on the first Saturday. We continued the work between January and March working through some very hard terrain, and finally completed the 61 step target in early March. The results from the last few month speak for themselves, and we should be incredibly proud of what we’ve achieved as a group. We’ve got two galleries of images from the project; one with our usual working party before-after photos, and another in our completed projects files. Please take a look and see what you think of the finished project. This entry was posted in Uncategorized on April 6, 2015 by David Martyn.